Second in Deborah Harkness’s bestselling All Souls Trilogy, Shadow of Night is a breathtakingly beautiful and historically rich tale of love and marriage, trust and family, magic and mystery, and a long lost manuscript known as Ashmole 782. 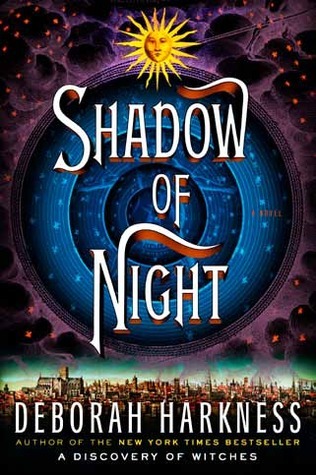 Picking up where A Discovery of Witches left off, Shadow of Night plunges its readers into the intricate and colorful world of 16th century Elizabethan England, where Diana and Matthew find themselves among Matthew’s friends, a famed group of poets and scientist known as the School of Night. Still, journeying into the past to find a manuscript and a witch to educate Diana quickly proves to be a much more cumbersome and time-consuming task than Matthew would expect. And soon the whirlwind of intrigues and conspiracies, not to mention Matthew’s countless identities and many masters, threaten to envelope them all together. From the cunning court of Queen Elizabeth I, to French domains and enigmatic persona of Matthew’s father – Philippe, to the artistic wonders of Prague and the Holy Roman Emperor, Rudolf II, Diana and Matthew will be tested in more ways than one… Along with a cast of incredibly multifaceted characters both new and old Deborah Harkness takes us on a journey through time. I first read A Discovery of Witches and Shadow of Night back to back in the summer of 2012 and fell in love with its characters and magic. I’ve never considered myself much of history buff but Deb has made a convert out of me – her vivid prose brought to life the events of the past and revived my interest in both history and reading. Feeling immersed in this magical world and invested with Matthew’s and Diana’s story I plunged in, savoring as much as I could. And the second volume delivers without a doubt (although A Discovery of Witches remains my personal favorite). The character growth is tremendous. We get to see and learn more of Matthew’s history, while Diana slowly comes into her own powers. And there is no doubt that she will be a force to be reckoned with in the future. But Diana’s life has been changing so rapidly and having suddenly found herself in the 16th century she has to deal with more than just adjusting her speech, dress, and learning to behave like a proper Elizabethan wife. Her newly married life also proves at times challenging. Not to mention that they have to deal with a growing household among other things. So expect adventures and much more. There are plenty of moments to love in this book, from seductive and playful, to touching and heartbreaking, it is an emotional rollercoaster and I dare you not to fall in love. So, if you’ve read an enjoyed A Discovery of Witches this gorgeous follow-up novel is a delightful treat and a must read. Yes, yes, yes! I have mad love for this series and your review is beautiful!!! !